What is the elevator guide rail of Elevator Spare Parts? Elevator guide rail is the safety track of the elevator running up and down in the well road; and is also one of the elevator spare parts. It can be known that the guide rail is be installed on the hoistway wall; and be fixed and connected between guide rail bracket and rail support on the hoistway wall. The common guide rail for elevators is ‘T’ shaped guide rail. For this kind of elevator parts, it has the characteristics of high reliability, high safety and low security. The guide rail plane must be smooth, with no obvious uneven surface. Due to the guide rail is shuttle track for guide shoe and safety gear of car, so the clearance must be kept during installation. 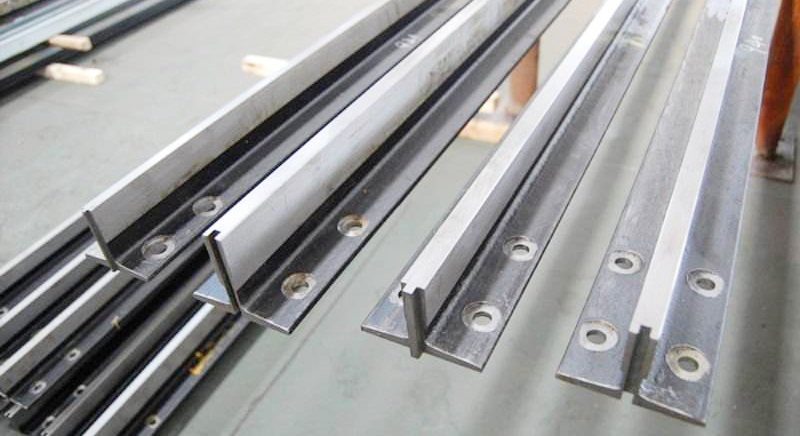 The rigidity of guide rail cannot be ignored, because it will be born import duty for stop running when elevator happens the speed of the accident. In addition, to better help everyone to know guide rail more, EIevatorvip will more introduces the elevator guide rail application. The guide rail is a rigid track that is installed between two or more columns in an elevator shaft or between floors, and to keep car and counterweight edge to move up and down, to ensure that escalators and sidewalk elevator are tilted or horizontal moving along with guide, providing guidance for the elevator car, counterweight, or step. According to the definition of elevator guide rail, the guide rail is an important reference part of elevator, escalator, and sidewalk elevator, it controls the elevator car, escalator, and step moving trajectory of sidewalk elevator, and ensures the transmission of operation signals. It is also an important part of elevator safety and operation quality, so it should not be used lightly. Posted in Technology and tagged elevator car, elevator counterweight, elevator guide rail, elevator guide shoe, elevator hoistway wall, elevator parts, elevator rail support, elevator spare parts, escalator guide rail, guide rail bracket, sidewalk elevator guide rail, T shaped guide rail.